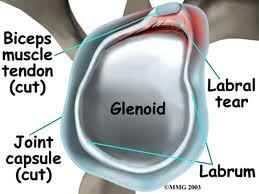 Carpal Tunnel Syndrome … oh no, not again! Carpal Tunnel Syndrome … oh no not again! It began this afternoon, a twinge on the inside of my left wrist, and then the sudden awareness that my pinky finger and ring finger were feeling a bit numb. Talk about an “oh no” feeling, I had surgical treatment for the same thing in my right wrist about nine years ago, so the thought of having to repeat is not exactly high on my list. 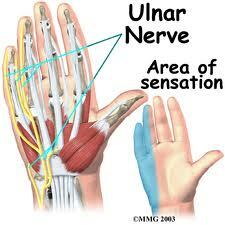 While carpal tunnel syndrome generally entails a narrowing of the sheath where the nerve that feeds the thumb, index and middle finger (medial nerve), it can also cause symptoms in the Ulnar nerve. Thinking about it and given that I’ve had relative wrist health (with the exception of a ganglion cyst on my wrist as a result of rehab on my shoulder), my first question was what’s different? The obvious culprit was a new keyboard at work–slightly smaller, lighter and not as angled as the previous one. I certainly hadn’t given it a thought, but as each new key stroke caused yet a new ache on the top of my wrist, I knew I was probably onto something. The mechanics of my body position in relation to the keyboard aside (which will have to get dealt with tomorrow), my task now is to immediately reduce the inflammation, which includes taking an anti-inflammatory (ibuprofen or aspirin). 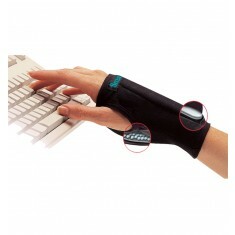 Next up will be wearing a wrist brace to keep it angled in a non-stress position for a few days. 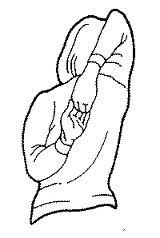 There are also a series of exercises that can be done to aid in wrist health. The main thing is to address it fairly immediately and if it continues over a few days–to seek out medical attention. The main thing is to see if non-invasive treatments can be started to mitigate the problem before it gets to the point of requiring serious medical intervention. 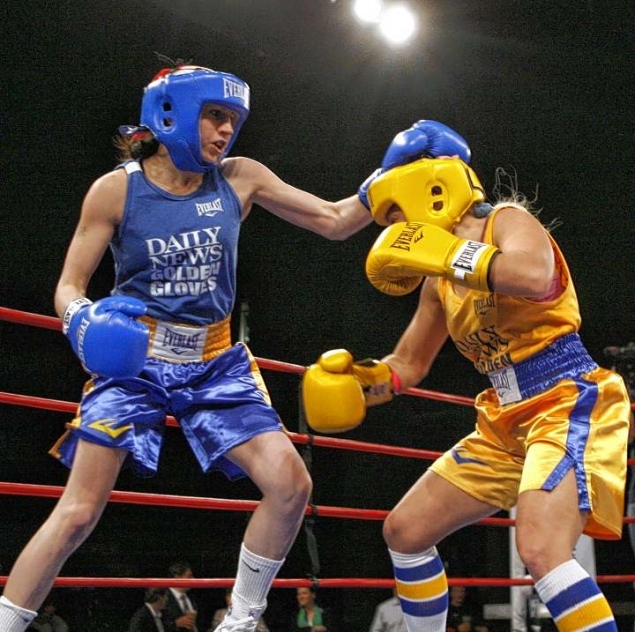 Aside from my absolute joy at the fact that Christina Cruz won her sixth (count ’em) New York Golden Gloves Championship (not to mention that she is the 2012 USA Boxing National Champion at 118 pounds!) boxing has definitely had the better of me lately. And while I go to bed thinking about my left dig and wake up thinking of how to work in the left hook off the jab, my body isn’t cooperating in fact it’s in downright rebellion what with a labral tear in my right shoulder socket (that’s along the top, a classic repetitive stress injury from banging) and supraspinatus tendinitis (yep, plus a rotator cuff injury)! 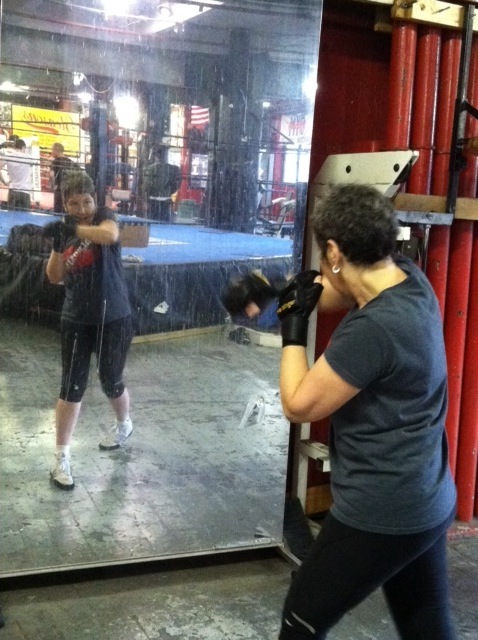 To go back a step or two, I’ve had intermittent pain in my shoulder area since about Christmas, mostly when I’d throw a right cross and sometimes on the speed bag. It wasn’t awful, but if I moved my right arm back, I yelped a definite “ow.” I was easy on it and figuring to lighten the exercise load tried swimming. It turned out that didn’t work out well either as I could only swim using a Side Stroke because the overhand movements of the American Crawl stroke — and the lateral movements of the Breast Stroke caused even more ows than boxing. The ouches seemed to subside and I thought, must be a trigger point or something because the discomfort was mostly felt in the back of my arm. 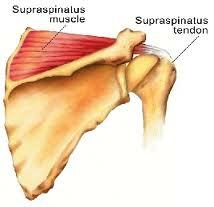 Still, it didn’t go away, and I began thinking it might be a rotator cuff injury which can be more serious. 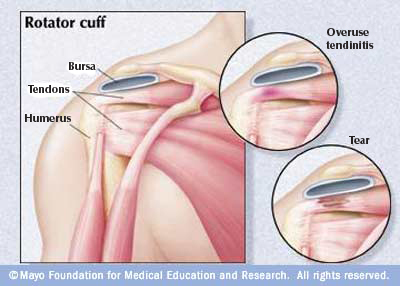 Rotator cuff injuries up to and including actual tears involve the tendons and muscles outside the shoulder joint where the tendons attach the muscles to the humerus (arm) bone. In the case of boxing, the constant repetitive motion of throwing punches, not to mention, banging away, hard, on heavy bags, pads, not to mention sparring can certainly cause injuries. With that in mind I headed over to an orthopedist at NYU/Hospital for Joint Diseases and within about five minutes, some “popping sounds” and several pushes on my right and left arms he was convinced I was suffering a rotator cuff problem and ordered up an MRI to be followed by physical therapy. After talking it over with my doctor, we both agreed that a conservative approach was preferable, so the next will be physical therapy (tomorrow) with a focus on treatment, pain relief and muscle strengthening to give better support to the shoulder area. 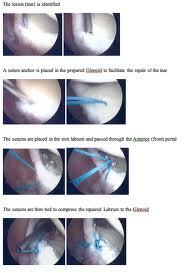 Unfortunately, when it comes to SLAP tears, the alternatives after physical therapy can be rather bleak — as in arthroscopic surgery, though my doctor feels strongly that the physical therapy should do the trick, and with your indulgence I’ll likely write another piece about the physical therapy process once it gets going. The real cautionary tale here is that if you shoulder is starting to “catch” when you pull your arm back, or if you find it aching to the point of an “ow” after a work out, do get it checked out. There are, it seems, a lot of things that can go wrong with the shoulder — and a good course of physical strengthening of the muscles in the area, as well as good warm-ups may mean the difference, especially if you are shall we say … older! 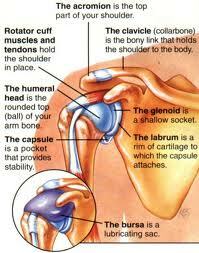 For some more information on rotator cuff injuries and SLAP injuries here are some links!